Get lost in your 80’s nostalgia and relive the glory days of summers at the arcade with The Games Company’s trailblazing game, Light Racers! 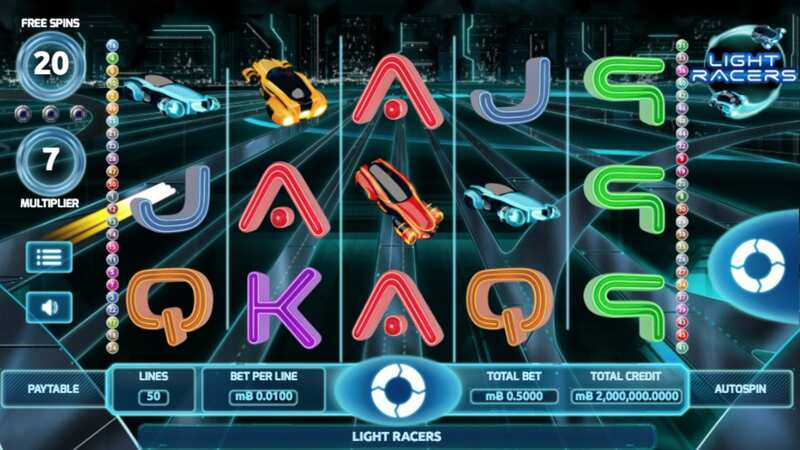 If you’re a fan of sci-fi you will love this Tron-themed futuristic online slot game, From the Techno-Metropolis backdrop to the animated light-emitting traffic it truly is an 80’s kid’s dream. With many features from the “Scatter Sphere” to the “Light Racers Wild Logo”, there are no shortages of ways to win big while reliving your childhood glory days. Dare to blaze your own trail and get ready… set… GO! Click to see these slots online today. Causing ripples in the online gambling industry despite being fairly new to the scene, The Games Company does not disappoint when it comes to slot games. With games such as KGB Bears, Witch of the West and Mariachi Mayhem under their belt you can be sure Light Racers will not disappoint fans to play slot games online in the slightest. From their humble beginnings in 2012 in London, The Games Company is surely a developer to keep your eyes on for adrenaline fuelled gameplay with a comedic edge! Live life in the fast lane and dominate the race with style in the fast paced, adrenaline pumping experience that is Light Racers! Sporting a 5x3 reel setup with up to 50 pay lines there is no shortage of ways to win big. needing only two cars on a pay line for a basic pay out you can get started fairly easily, however, the biggest paying car is the green car, offering a whopping 500 coins if you can manage to land 5 in a pay line. So many new slots to choose from? Read our guide to help you choose and play best slots now! 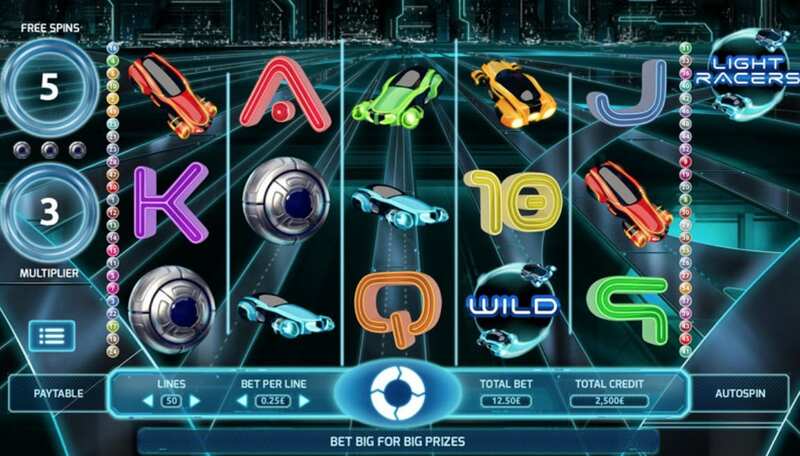 Be sure to also utilize the “Light Racers Wild Logo” which can be substituted for any other game icon except the “Scatter Sphere” which itself awards free spins and multipliers whenever you acquire 3 or more of them in any of your active pay lines, these can range from anywhere between 8 to 25 free spins and a multiplier of anywhere between 2x and 10x! With the option to choose to play from 50p to £100 a spin you can rack up some big money in this online slot game. With a smooth sleek main colour scheme of blue, white and black this online slot game is very easy on the eyes, combine this with the pumping techno soundtrack, animated icons and beautiful sprawling metropolis and you get an engrossing, exciting and most importantly fun experience. If you’re looking for a fun, nostalgic and entertaining experience then look no further than Light Racers. The theme of a sprawling metropolis goes very well with the styles of the number icons as well as the four unique cars which are very reminiscent of the iconic light cycles from Tron: Legacy giving Light Racers a very polished, futuristic feel that appeals to any lover of Sci-Fi or 80’s nostalgia. if you enjoyed Light Racers why not try KGB Bears?